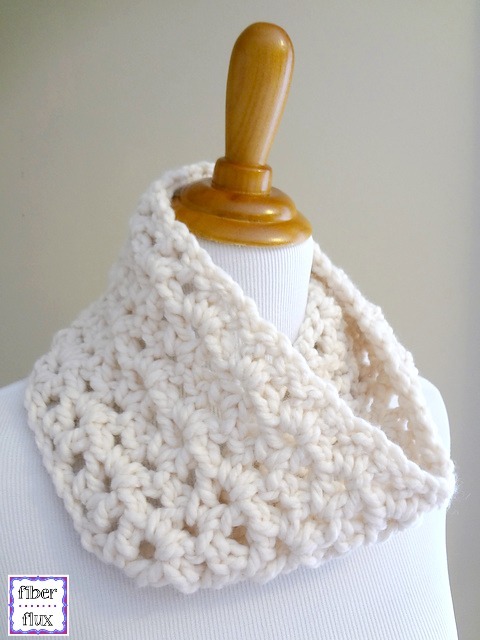 The Meringue Cowl is a sweet and simple cowl that works up lightning fast. Like a luscious dollop of meringue, this cowl is worked in a beautiful and easy to crochet v-stitch. A great project for quick gifts, but don't forget to make yourself one too! Width-Scarf shown is 6 inches wide, but you can easily make your scarf wider by working more rows. Circumference-Cowl pictured is 24 inches around. Ch 49 (To change circumference sizing, chain in multiples of 15+4). Repeat row 1 until desired width is reached. Cowl shown is a total of 6 rows of stitch pattern, with yarn leftovers. Seam and weave in any ends. I left a long tail when I was finished and just used that to seam it together. Click below to watch a video on how to crochet the Meringue Cowl stitch by stitch. This cowl was inspired by the Pavement Infinity Scarf and the Pinot Noir Infinity Scarf...if you like this pattern, you'll like these too! Hey, what a beautiful cowl! And such a yummy name :-). Thumbs up & thanks for the pattern! Beautiful :) Would it work with a 5 weight chunky yarn do you think? I think it would be really pretty! If you need to compensate for the yarn with sizing, the beginning chain is in multiples of 15+4...happy crocheting! Thanks! I'm a total beginner...could you explain what the 15+4 means please? Is that chain 15 and 4 rows? Yes, the 155 is the multiple of the repeat, and then add 4 onto that...so you could do 15+4 or 15+15+4 or 15+15+15+4 and so on. The reason for this info in a pattern is if you wanted to make it wider you could. Hope that helps! I made two of these beautiful cowls yesterday. They worked up quick and look awesome! Thank you for sharing this great pattern! Thanks so much and yay! Glad you liked making them! Your scarf is beautiful! I am not clear on your instructions for foundations. Your instructions says: "In the 4th chain from the hook, work dc, ch 1, dc in the same ch. *Skip two chains and then in the next ch, work dc, ch 1, dc in the same ch. Repeat from * to end. when you say dc in the same ch, is that the same chain as in the 4th one or the same one that was chained (ch 1) . written instructions sometimes can be skewed. Do you have a video on youtube? Keep going in this sequence until you reach the end. Does that help? If not please let me know! Thank you so much for this gorgeous pattern! 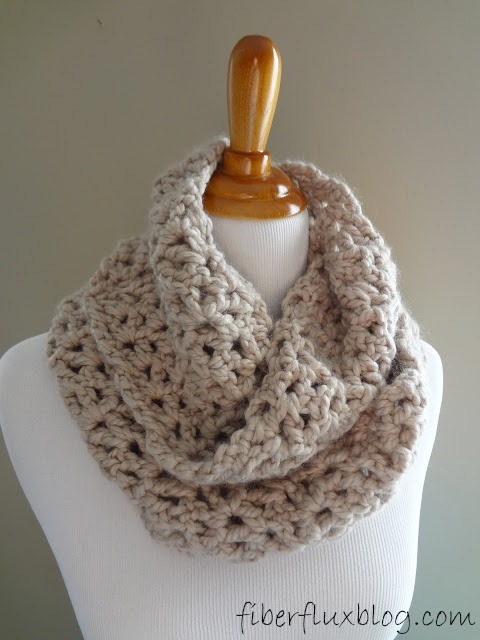 I love crocheting & this cowl is so perfect! You're very talented! Hats off! -work double crochet, ch 1, double crochet in that very last ch? I'm brand new to crocheting, thanks for your help! Actually the foundation ends with a dc, ch 1, dc. Then you making your turning chain and turn and begin the next row. Work that row as specified, then at the end of row 1 and each row after, make one dc in that last space (the turning chain space). Hello dear Jennifer. Thank you for your nice pattern - and I just finished a "Prayer Shawl" in the "V" stitch. It is truly a very easy pattern. I like it as one do not have to count loads and loads of stitches - just one. I have been crocheting now over 60 years. First I loved doing fillet crochet - but now I am working with much-much thicker yarn! It is lovely to learn that so many of dear lady's learning to crochet! it is just wonderful. May You and all the people who crochet wishing all the very best. Crocheting is the most cleanest, charming and addictive relaxation pass time - there is no other. May You and all the lady's even gentleman have a wonderful crocheting time in the future. God bless you all. I enjoyed reading your comment, brought a smile to my face today, thanks for your kind words! :) Happy crocheting! Thanks for the beautiful pattern. If I give you credit for the pattern and your site, could I sell these cowls in our local fiber festival? A portion of the sale price goes to support the fiber arts guild which uses funding for community projects. If it is going to a good cause or charity, go right ahead and keep doing good works for your community! Hi Jennifer, Barbara here from Australia, I would so dearly love to make one of these, but the largest Hook I can come up with is an 8mm, walked the craft stores here and it is impossible to find anything bigger. Can I just adjust the stitch number to more and work more rows. How many stitches would you suggest. Oh, Barbara again, the thickest yarn I have is a 12-ply, not sure of the number. Hi Barbara! I would try making a swatch with the particular hook you have...sometimes when I'm not sure I'll work up a little sampling in order to make sure it looks the way I want it to look...hope that helps! Why won't your patterns print as shown on screen??? I highlighted and clicked to "print selection" What a waste of paper and still don't have instructions. I'm about ready to quit receiving your patterns. So sorry you are having trouble...try highlighting needed text, click with the right mouse button and select "copy" then paste to a Word document. That way you'll only have what you need (without anything extra) and you can save it for later too. Hope that helps! Hi there, try this for printing: try highlighting needed text, click with the right mouse button and select "copy" then paste to a Word document. That way you'll only have what you need (without anything extra) and you can save it for later too. It'll walk you through the stitch sequence, stitch by stitch. Great pattern! After foundation row, chain 3 and then is your first V in the first V of the foundation row? I did that and it makes it longer than the foundation row. This is the beginning of Row 1. Thanks! It is for a different scarf, but uses the same stitch, so you can see it come together. Hope that helps! hi I love your patterns and I cant wait to make the cowl. I do have a question though. when you start the first you you say chain 1 and turn . do you mean that at the end of the foundation row you chain and then turn . or turn at the end of the row and then chain...I hope I explained this right...I haven't crocheted in a long long time and only knew basics so I am learning all over again basically...and I've always had trouble reading patterns... thanks so much. Hi there! Great question! When moving on to a new row, you can either chain three and turn (flip the work) or turn first, then chain three. Either way will work. Happy crocheting! What is the V stitch? The V stitch is the stitch worked in this project. Each V is made by working a dc, ch 1, dc, creating the "V"
Kind of a dumb question since I'm going to attempt it anyway, would it be possible to do this with just one skein of Hometown USA Lion brand? It's, I believe, 20 yards shorter than the Thick and Quick. I have a pretty emerald green I want to use but I always sub Hometown for T&Q and in some cases, I am very, very short on yardage. You can totally use this yarn, you just won't be able to work as many rows that the pattern calls for, resulting in a shorter height cowl. If you're OK with this, I say go for it! I've never crocheted a cowl before (though I crochet a lot of scarves, blankets, etc.) and wanted to know when you say 1 skein--how many oz. do you mean? Your pattern sounds so simple & easy to follow. Just curious about the amt. of yarn. Thank you. Hello. If I want a longer cowl how many chains will need to start out with? Sorry I'm a little lost. Beautiful pattern by the way. Your hook size says N (9,00 mm) but the Susan Bates hook I have says N (10.00 mm). Can the number N have 2 sizes? I'm confused which size hook to use. I love this pattern and want to make it. Great question! Just make sure it is a 9.0 mm hook...the letters are sometimes different brand to brand, but you'll be good with the 9.0 mm...hope that helps! Thanks for your clarification. I love the way you make crocheting so easy. Thank you. This is such a beautiful pattern! I was wondering though, can this be done with worsted weight? I am making it as a gift and the wool is to heavy for her....thank you!! This is a delightful pattern, very easy and work up very quickly. However, I want to make a matching ear warmer headband, so it needs to be a couple of inches shorter. Will this only work with multiples of 15 + 4? It's a bit short at 34 stiches. Can't wrap my head around the numbers. Hi. Just finished another scarf using this pattern after quite a while. Enjoyed doing it again! Thank you. Jennifer, This is a lovely pattern. Thank you! Why not make an intermediate level one and do it in the round? Then no seam. Thanks again! I like the pattern. Can it be increased/adjusted for a prayer shawl? Why does it matter if it's a multiple of 15? I chained 61 and it worked out fine. Maybe I'm missing something? I'd like to make this longer but am confused I the 15 +4 concept? 2019 and your cowl is still being made . Classic never goes out of style .